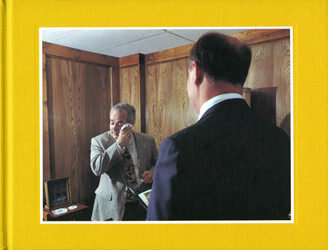 48 pages, hardcover, 10 " x 8"
In 2001, Darin Mickey began to document his father's life at work and at home. Stuff I Gotta Remember Not To Forget is a portrait of Ken Mickey, who sells storage space in converted caves and abandoned mines throughout Kansas. We follow Darin following his father as he makes cold calls, watches television, attends meetings at the Masonic Temple, drives through underground tunnels, and drinks his scotch on the rocks. Mickey's pictures deftly depict the feelings an adult has toward his parents; an unfamiliarity with the familiar, and the vying feelings of attraction and rejection toward where one comes from. The title - taken from a Ziggy bulletin board - implies both the ambivalence and urgency of what family means once one leaves the fold. As much a memoir of Mickey's family life as a portrait of a salesman, Stuff I Gotta Remember Not To Forget is a document of the suburban midwest, in turns honest, ridiculous and tender. Darin Mickey is a photographer, musician, and a teacher at Cooper Union and the International Center of Photography in New York City. This project is funded in part by Ambergris Projects, LLC.